Let’s talk game day grub. Hands down the best crowd pleaser has to be a pig in a blanket. Kids love them because they are mini hot dogs and adults love them too. 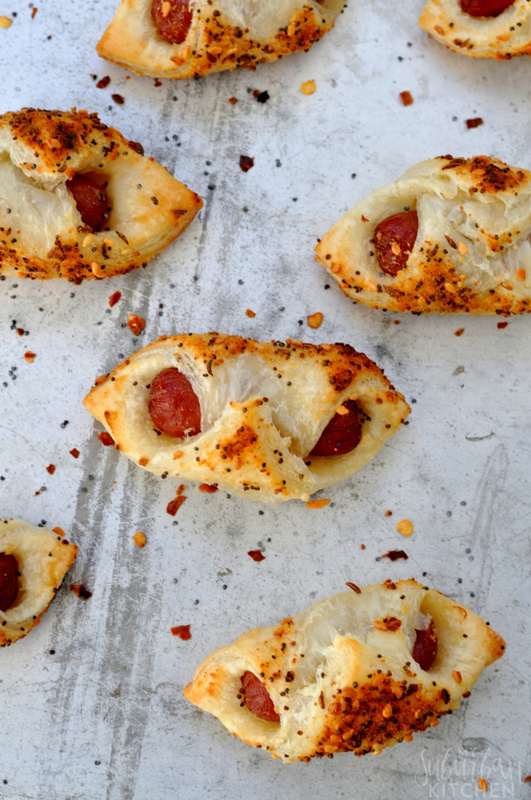 These everything pigs in a blanket are a definitely must for your game day menu. 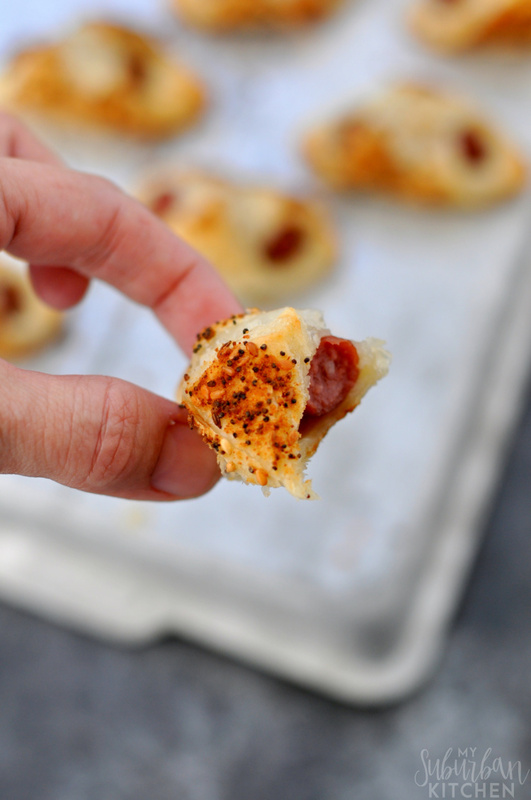 I use mini cocktail sausages for my everything pigs in a blanket but you could easily use hot dogs cut into smaller pieces if you prefer. The key to making these fantastic is the herb mixture on top that makes it like an everything bagel. Yum! 1. Preheat oven to 375 degrees. Line a rimmed baking sheet with parchment paper. 2. In a small bowl, combine topping ingredients. Stir well. 3. Lay the puff pastry squares out on prepared baking sheet diagonally. Place cocktail sausage on top and wrap it. Flip over so seam side is on the bottom. 4. Brush the puff pastry with melted butter. Sprinkle with topping mixture. Bake in preheated oven for 10-15 minutes or until puff pastry is lightly browned. These are delicious all on their own but you could also pair them with a yummy BBQ sauce or other dipping sauce for a fantastic game day appetizer everyone will remember! What are you serving this weekend for the Super Bowl? Do you love pigs in a blanket? Preheat oven to 375 degrees. Line a rimmed baking sheet with parchment paper. In a small bowl, combine topping ingredients. Stir well. Lay the puff pastry squares out on prepared baking sheet diagonally. Place cocktail sausage on top and wrap it. Flip over so seam side is on the bottom. Brush the puff pastry with melted butter. Sprinkle with topping mixture. Bake in preheated oven for 10-15 minutes or until puff pastry is lightly browned. These are tasty and easy to make. Thank you for sharing at Dishing it and Digging it link party. My granddaughter loves pigs in a blanket and your look scrumptious. Thank you for sharing your recipe at the Snickerdoodle Create~Bake~Make link party! Sounds yummy! 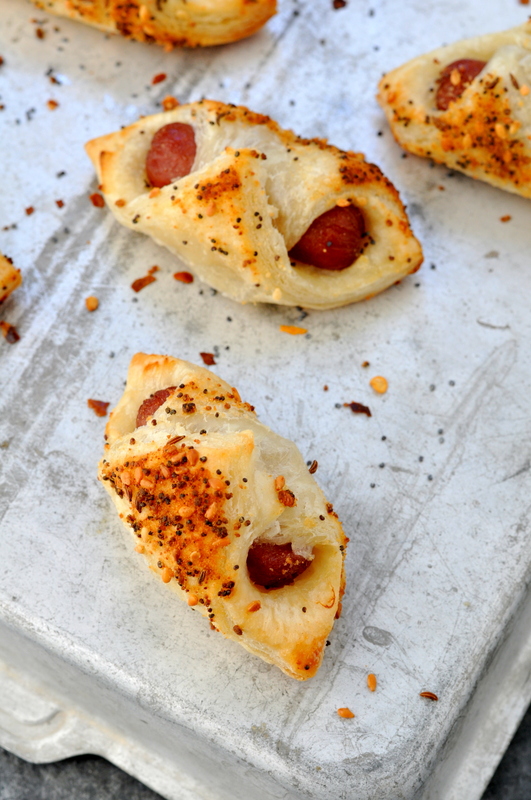 We are big fans of pigs in a blanket over here but I find myself wanting them to have a big more variety in the flavor department – this recipe would do that for sure. I’ll have to try it as soon as I get a chance! The seasonings sound wonderful. I wonder how they would work with biscuit dough? 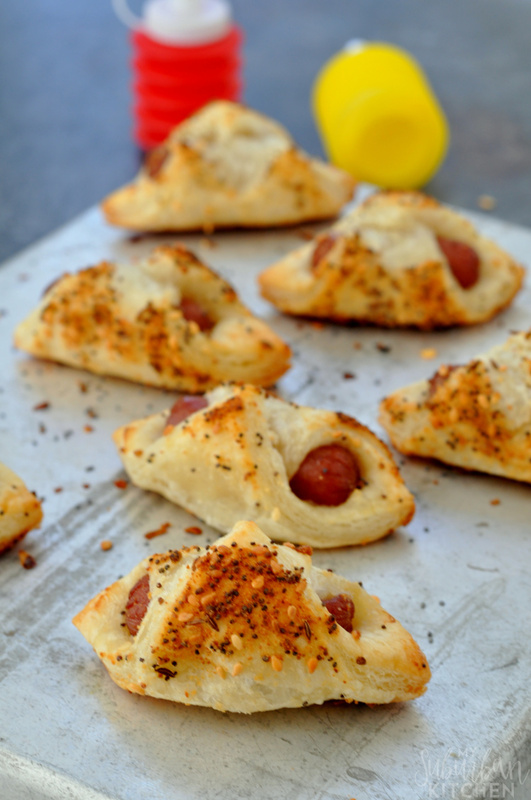 Two of my favorite comfort foods in one: everything bagels and pigs-in-a-blanket! Love this! Your Pigs in The Blanket look so good! Happy Valentine Day and thanks so much for sharing your awesome talent with us at Full Plate Thursday!